Not in North Carolina? Book here! 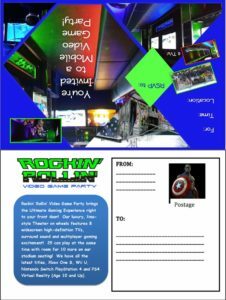 Download our Rockin’ Rollin’ Video Game Party™ Birthday Party Brochure. See what all the FUN is about! Print it out and show your friends! 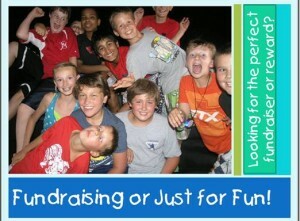 Download our Rockin’ Rollin’ Video Game Party™ School Fundraising Brochure. Great for schools, churches, youth groups, civic groups…we’ll make your event even better! 8:00 AM – 12 AM. Open on Holidays – Holiday Pricing will apply. — Please contact for special hours, such as late night or early morning. Let us help you custom design your event. Feel free to contact us or book your next event now! 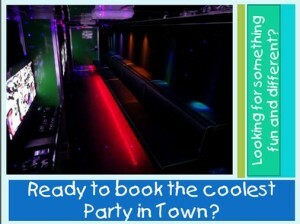 *1 hour parties are also available when booking. Limited to 20 mile radius of 28374. It’s the Ultimate Birthday Party in North Carolina! Tired of throwing the same old birthday party? Looking for a North Carolina birthday party idea that makes you a hero, while making their special day easier on you? Rockin' Rollin' Video Game Party™ provides the ultimate no stress – no mess birthday party experience! We will make your next birthday party special, whether for a kid, or for a kid at heart. Your birthday boy or girl will be thrilled beyond compare when our 32’ limousine styled video game theater rolls up to your residence! Inside our Mobile Video Game Theater, we provide comfortable stadium seating for up to 26 with high tech video and audio, and up to 29 guests can play at once! We've got the best consoles, 8 high-definition TV's and a Virtual Reality Gaming Station Our mobile game theater is climate controlled, so we’re ready to party year round! Weather permitting; our two outdoor game stations add another 8 guests that can play at the same time. Got your dance moves ready?
" wanted to let you know that the guys that had the game truck were awesome and super friendly with the kids - as usual - another success "
Thanks for doing a great job! You are great to work with! "Many thanks to Kevin!!! The kids had so much fun. Posted some pictures on Facebook." like they really wanted them to have a great time. I am pretty sure that you will get a couple of bookings from this event. We did not realize that Union Pines School had their first homecoming since 1983 and ball game conflicting with our event, so attendance was not as great as we anticipated, but it was still a great success, and we can't wait to do it again. Once again Thank You, Thank you, Thank you"
"Loads of Fun! Would Definitely book again. The kids loved it!" "The kids had a great time. As I told the game coach, the boys are all on the autism spectrum. They do get distracted easily and lose focus. That does not indicate in any way that they did not have a good time. All of the kids in his class were talking about the party at school on Monday. One of the parents at the party got your contact info. as he was interested in scheduling a party for his son. I would be more than happy to spread the word for your business in any way. You are a genuinely kind and a giving company and I am thankful for your act of kindness."